The Lynchburg News & Advance printed an editorial today that looks at the needs of Virginia’s workforce through the current recession and beyond. Despite the sour national and global economies, things will turn around, hopefully sooner rather than later. When the economic clouds part, the American worker had better be ready for an even more competitive world. The editorial explains how Virginia’s Community Colleges, while working through the recession and the government budget challenges that spin-off from it, are focused on the global competitiveness that Virginia communities and employers will need to succeed in the long run. The commonwealth, in the short run, is facing a budget shortfall of enormous proportions; long term, though, the shortfall in education and competitiveness are of mammoth proportions. Working with private industry, the community college system, in the last decade, has implemented a number of programs and partnerships designed to address the educational challenges the state faces. The start of the 2009 session of the General Assembly is only weeks away, and the specter of a $3.2 billion shortfall looms over the state Capitol. Now is not the time, though, for Virginia’s leaders to short shrift the future. Bad economies are ugly and painful, but the only way to minimize their impact is to ensure that individuals and companinies in Virginia are creating and attracting job opportunities and that requires the cutting edge skills and knowledge that more than half a million people are getting through academic and workforce training programs every year at Virginia’s Community Colleges. Luckily, at any of Virginia’s Community Colleges, the opportunity to explore highly sought after, high wage jobs are endless. From engineers to nurses, a certificate or associates degree from a community college can give you the best of both worlds: a career that you love and pays well. 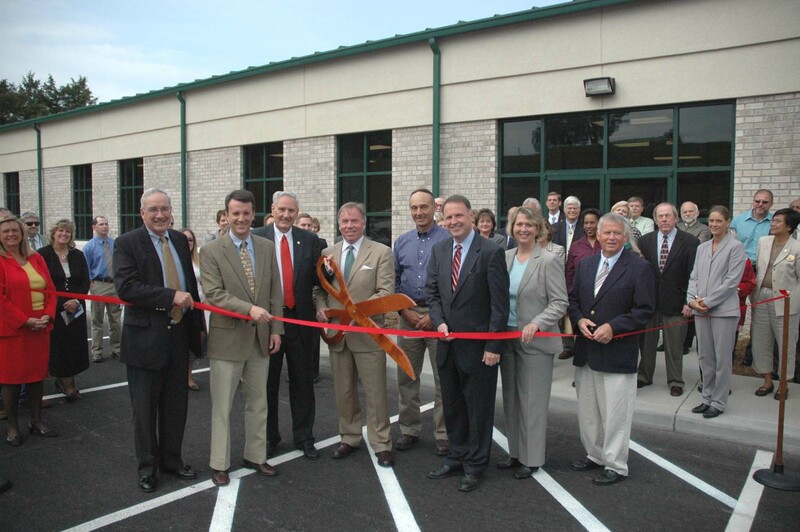 Local and state dignitaries joined in an open house and ribbon cutting ceremony on October 7 for Dabney S. Lancaster Community College’s new Rockbridge Regional Center in Buena Vista, VA. Participating in the ceremony were: Lexington Vice-Mayor Tim Golden; House of Delegates member Ben Cline; DSLCC President Dr. Richard R. Teaff; Dr. Glenn DuBois, Chancellor of the Virginia Community College System; Mack Smith of the Rockbridge County Board of Supervisors; State Senator Creigh Deeds; Debbie Garrett, representing Congressman Bob Goodlatte; and Buena Vista Mayor Mike Clements. The 15,000 square foot, $1.5 million training center has been open to students since August and features a computer lab with 24 stations, two compressed video labs, a testing center with computers used for proctored testing, two traditional lecture classrooms, a conference room and two offices, a health sciences lab and a greenhouse. This is the fourth and largest location for the RRC, since DSLCC opened a site to serve the Rockbridge area almost 13 years ago. The first RRC opened in March, 1996 but the facility space was quickly outgrown by the student population. The Virginia SHARE Network is to be “congratulated for designing a program that focuses on the employment needs of people in the community and matching those needs with demands of business and industry,” said Brent Orrell, Deputy Assistant Secretary for Employment and Training at the U.S. Department of Labor. Orrell served as keynote speaker at the SHARE Network meeting and awards ceremony on Friday, Oct. 3 at John Tyler Community College’s Chester campus. Approximately 50 faith-based and community-based organizations and individuals from around the commonwealth were honored for contributing to the SHARE workforce investment system. The honorees offer job-search assistance, résumé help and other services to aid Virginia’s displaced workers find employment. In its first year, the Virginia SHARE Network has exceeded its goal of implementing 17 SHARE Network Access Points (SNAPs). According to Dr. Kathy Thompson of the Virginia Community College System, there are 32 fully recruited and trained SNAPs – and more to come!